Registration for the 2019-20 private transportation program is available HERE. The DEADLINE for new families to enroll is Friday, May 3rd. PRIVATE BUSES AND VANS: Transportation to Fenn is available from many towns in the Metro-West area. Please refer to the list at the right to see where we currently provide service. For more information about our private transportation program, click here. CONCORD BUS: Through an agreement with the CPS Transportation Department, Fenn families living in Concord are welcome to use public school bus system at no charge, with the exception of public school vacations, when the buses are not in service and families will need to drive their son to school. PARENT CARPOOLS: In addition to our transportation programs, there are a large number of active carpools available in many communities. Fenn encourages families to carpool and our office is happy to provide town-level contact lists to any family seeking to coordinate a carpool. Drop off at Fenn by car should by by 8:15 a.m. for advisor. Extended morning begins at 7:30 a.m. While we expect most morning drop-offs to run well and not require you to queue much time at all, please understand that during these first couple of days it often takes longer at drop-off and at pick-up. 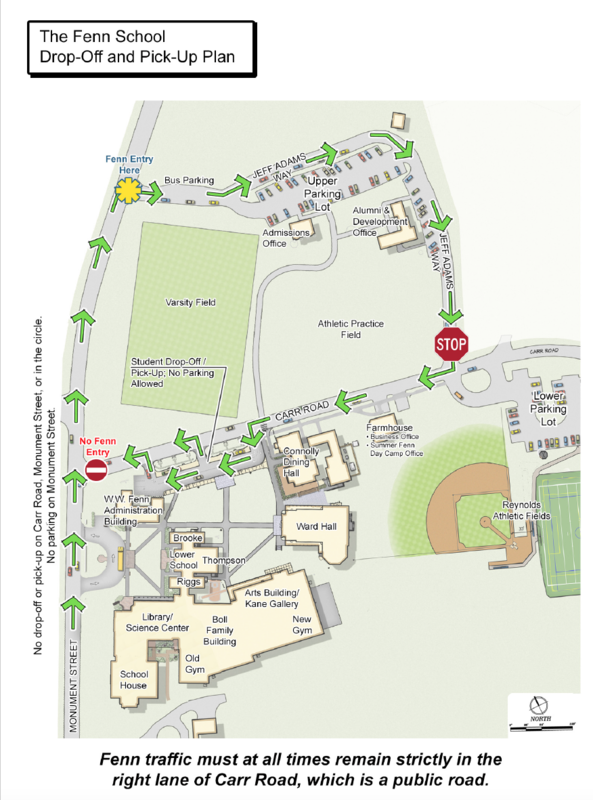 Entry to Campus: Please remember that for both drop-off and pick-up you should enter the campus at Jeff Adams Way. Please note the two speed bumps on campus, one as you travel through the upper parking lot and one just before the STOP sign on the entry drive at Carr Road. You must slow to a complete stop at the STOP sign before turning onto Carr Road. Please remember that Carr Road is a two-way street and cars can approach from all directions-please look left, right and ahead before turning onto Carr Road and please stay on the RIGHT side as you travel on Carr Road. Fenn regular dismissal, including on our first day, will be at 3:50 p.m. for the Lower and Middle School and following sports at 4:50 p.m. for the Upper School. Arriving closer to 4:00 p.m. for Lower and Middle School division pick-up, and closer to 5:00 p.m. for Upper School division pick-up, will allow parents to spend less waiting time in the queue. At all times, we request that if you arrive early and are waiting in queue for more than 3 minutes that you turn your car off to avoid idling. We expect that the pick-up and the drop-off process will become smoother over the first few days of school. Pick-Up Procedures: Cars, upon entering the loop road at the north end of the campus, will be asked to split into two lines of traffic: one on the loop road and one in the upper parking lot. You can use these two lines throughout the school year. These two lines will then merge back into a single line, heading down the left hand side of the loop road towards Carr Road. You should use both lanes at all times, being careful as you drive through the parking lot. Please help us by allowing a smooth and efficient merge of the two lines back to one at the turn in the loop road. We make these requests so that we can keep traffic off of Monument Street which is a safety issue. Cars will then proceed to the pick-up area, pick-up their passengers and depart.